How I got this watch: I contacted Bremont directly to request a review piece and suggested either the ALT-C/PB or the MBII-WH. Bremont sent me a MBII-WH to review which I wore for two weeks. This is not a paid review. The Bremont MBII-WH is the best watch I've worn all year. That's a bold claim but I stand by it. The MBII-WH isn't perfect but I loved wearing it despite its flaws. 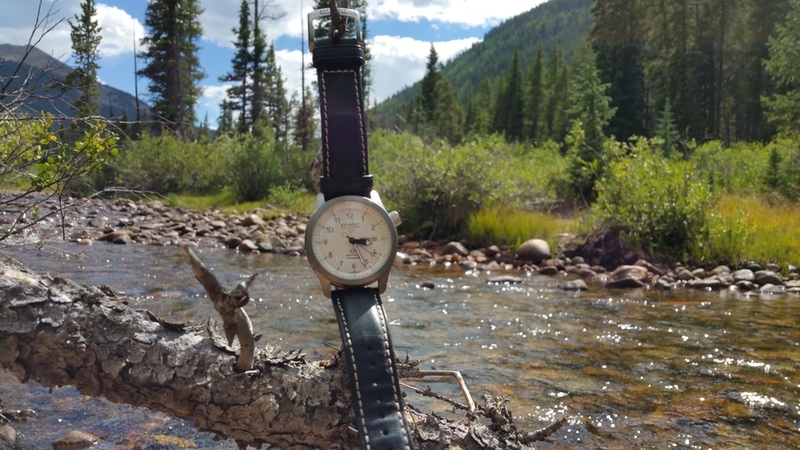 Bremont say that their watches are tested beyond endurance and this watch couldn't have served me better when I was on holiday in Colorado. Bremont's "Tested beyond Endurance" tag line relates to the series of grueling tests that encompass the effect of high altitude, salt, humidity, extreme vibrations, extreme temperature and even a simulated ejection test on the poor mechanical watch. These tests are all related aviation, a field that Bremont has strong ties to; the founding brothers both being avid pilots and the company supplies various military units with custom watch dials adorned with their squadron's emblems. The 43mm hardened steel case feels entirely modern, yet remains a faithful evolution of the traditional pilot's watch, with the anodized colored barrel running through the center adding a flash of color. The MBII-WH feels incredibly study on the wrist and wears a lot smaller than its diameter might suggest but it does wear high with a slight domed crystal. Emblazoned on the dial are the word's ANTI-SHOCK which taunts the wearer, "Go on. Try and get me to fail. I dare you". The movement of the MBII-WH is attached to the main body in a flexible ring which absorb shocks and minimizes the energy (and therefore damage) that is transferred to the movement. The chronometer rated movement never lost a beat during my time with it and it is a real toss up between this and the Nomos Metro 38 Datum as to which was the more accurate. The movement itself is the Bremont Caliber BE-36AE which beats at 28,800 bph and has a thirty eight hour power reserve. If I was being picky I'd say that thirty eight hours was a bit low but seeing as I couldn't bring myself to put this watch down for more than a few hours it didn't bother me. Yes, the movement inside isn't in-house but I don't care and neither should you. It performs at chronometer rating and I believe that the modifications done by Bremont warrant the price of $5495. There will be those who believe that this watch is too expensive but I strongly believe this watch represents a lot of value. There is always room for improvement however and I would welcome an English in-house movement inside of the watch but I'm a patient man, I can wait a few more years. It took Nomos fifteen years to go from modifying ETA movements to in-house, Bremont have only been around since 2002. The Caliber BE-36AE is housed inside a Faraday cage which protects the movement against magnetic fields. Faraday cages have been used in watchmaking for almost a century now and have become increasingly obsolescent as silicon and other non-ferrous materials creep into escapements. However the Faraday cage, for the moment, is still the most popular option to ward off those pesky magnetic fields. Older cages weren't able to have any apertures as they would provide an entry point for magnetic fields however Bremont have sufficiently protected the movement to have both day and date apertures. The day date complication is controlled by the crown at 2 o'clock which also winds the movement and sets the hands; the crown at 4 o'clock controls the inner rotating bezel that sits against the case sides around the outside of the dial. When I put the watch on my wrist I realized that this watch wasn't made for left-handers as I had to contort my right wrist at awkward angles to turn the crown. Most of the time I just took it off and was forced to use my non-dominant right hand but the inner bezel is ratcheted so with every turn of the crown there is a satisfying click-click-click as the bezel passes each minute. During my holiday I used the timer to see how long I was delayed at the airport for (thirty five minutes), how long it took me to catch a fish (fifteen minutes) and how long my ascent of a small mountain was (The timer was not capable of timing that long). Whilst fishing I did come across my biggest issue with the watch, the leather strap. After purchasing some lures and borrowing a pole from the resort office I set about killing time by casting off into the lake. Retreating further into a 'Fisherman Zen state' I started wondering, what happens if I actually catch something? What happened if I had to grab the fish from the water? (Or more likely what happens if fall in ?) The watch is rated to 100 meters but the crowns aren't screw-down, a personal paranoia of mine, and the leather strap won't appreciate a dip. It's a comfortable, well made strap but I didn't want to explain to Bremont when returning it why their watch strap smelt of fish and lake water so I took it off and zipped it in my pocket. I want to reiterate that this wasn't out of concern for the watch itself but the strap, and I wouldn't have taken it off if it was on a bracelet or my own NATO strap. It's a good thing I did take it off when fishing because I ended up catching four Rainbow Trout in the space of twenty minutes. Every time I went to remove the hook the fish was slapping against my wrist struggling to get free, unaware that it was making my job of doing so that much harder. If I had been wearing the Bremont then the strap would have been covered in fish goop, sand and lake water so taking it off was a wise choice. When purchased the watch comes with a rubber strap and Bremont sells branded NATOs and a stainless steel bracelet on their site so there are options for those willing to take their Bremont out of the office and into the wild. It is these other strap options are what the MBII belongs on. The case of the MBII-WH is constructed in Bremont's patented Trip-Tick case design consisting of three parts; a hardened steel bezel which contains the sapphire crystal, the central body including the anodized middle barrel and the steel case back. The middle barrel can be orange, anthracite, green or blue with the option to swap the color during a routine service. The red barrel is reserved only for the MBI which is only purchasable if you have ejected from a Martin Baker ejector seat. Martin Baker are the first and final words in ejector seat construction with over 7400 successful ejections taking place since the first on 30th May 1949. This limited eligibility to purchase a wristwatch is almost exclusive to Bremont and further counts towards their passion for aviation. The combination of hardened steel, sapphire crystal with nine layers of anti-reflective coating, an anti-shock mechanism and just the general feel and weight of the watch had me feeling that the MBII-WH could withstand pretty much anything I threw at it. With the MBII-WH strapped to my wrist I could travel the world, roughing it across the Gobi or tackling the waves on-board a fishing trawler. Of course I'm not going to do anything of those things but when a watch invites and encourages those feelings, it has to be admired. I'd be interested to try the MBIII which has a more useful GMT complication but has the same case dimensions but for now, I'm more than happy with the MBII-WH. Released earlier this year, the white dial is the latest edition of the MBII and it provides excellent contrast against the thick black hands. The lume did glow as brightly as the Stowa Seatime ProDiver I had two months ago but I was confused by the relegation of the lume on the hour hand to a small triangle; I suppose it aided in visual diversity between the hands. The ejector seat ripcord balance on the end of the seconds hand is a delightful visual cue that is a subtle nod to the watches aviation namesake without hitting you over the head. My one downside to the dial is that in certain light the Arabic numbers can look a bit fuzzy compared to the crisp lume pips behind them though this bothered me less the more I wore the watch.